Angel Stadium is the site of the matchup between the Kansas City Royals and the Los Angeles Angels on Thursday, June 15, 2017. The probable starting pitchers are Matt Strahm for the Royals and Ricky Nolasco for the Angels. Kansas City opens at +129 while Los Angeles opens at -139. The Royals have a 27-33-3 over/under record and a 30-33-0 run line mark. 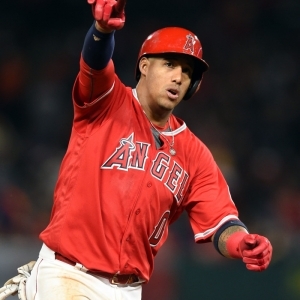 The Angels are 36-29-0 against the run line and have a 30-34-1 over/under record. The Royals have a 29-34 overall record this season. Starting pitcher Matt Strahm has a 1-3 record with an earned run average of 4.50 and a WHIP of 1.41. He has 26 strikeouts over his 22 innings pitched and he's given up 13 hits. He allows 5.3 hits per 9 innings and he has a FIP of 5.7. The bullpen has an earned run average of 4.63 and they have given up 213 base hits on the year. Teams are hitting .256 against the bullpen and they've struck out 208 hitters and walked 99 batters. As a team, Kansas City allows 8.9 hits per nine innings while striking out 8 batters per nine innings. They are 18th in the league in team earned run average at 4.33. The Royals pitchers collectively have given up 555 base hits and 271 earned runs. They have allowed 70 home runs this season, ranking them 24th in the league. Kansas City as a pitching staff has walked 221 batters and struck out 500. They have walked 3.5 men per 9 innings while striking out 8 per 9. They have a team WHIP of 1.38 and their FIP as a unit is 4.21. As a team Kansas City is hitting .241, good for 25th in the league. The Royals hold a .394 team slugging percentage and an on-base percentage of .297, which is good for 29th in baseball. They rank 24th in MLB with 8.1 hits per game. Lorenzo Cain is hitting .264 with an on-base percentage of .342. He has 61 hits this season in 231 at bats with 20 runs batted in. He has a slugging percentage of .407 and an OPS+ of 99. Mike Moustakas is hitting .278 this year and he has an on-base percentage of .315. He has totaled 63 hits and he has driven in 38 men in 227 at bats. His OPS+ is 125 while his slugging percentage is at .555. The Royals have 511 hits, including 91 doubles and 74 home runs. Kansas City has walked 154 times so far this season and they have struck out 478 times as a unit. They have left 385 men on base and have a team OPS of .690. They score 3.89 runs per contest and have scored a total of 245 runs this year. Los Angeles has a 34-34 overall mark this year. With an earned run average of 4.81, Ricky Nolasco has a 2-7 record and a 1.36 WHIP. He has 62 strikeouts over the 73 innings he's pitched. He's also given up 81 hits. He allows 10 hits per nine innings and his FIP stands at 5.62. The bullpen has an earned run average of 3.68 and they have given up 193 base hits on the year. Teams are hitting .227 against the Angels bullpen. Their relievers have struck out 247 batters and walked 76 opposing hitters. As a team, Los Angeles allows 8.3 hits per nine innings while striking out 8.6 batters per nine innings. They are 9th in the league in team earned run average at 4.06. The Angels pitchers as a team have surrendered 564 base knocks and 274 earned runs this season. They have given up 95 home runs this year, which ranks 2nd in Major League Baseball. Los Angeles as a staff has walked 204 hitters and struck out 579 batters. They give up a walk 3 times per 9 innings while they strike out 8.6 per 9. Their team WHIP is 1.26 while their FIP as a staff is 4.35. As a team, they are batting .240, good for 26th in the league. The Angels hold a .382 team slugging percentage and an on-base percentage of .316, which is good for 22nd in baseball. They rank 26th in MLB with 8.1 hits per contest. Andrelton Simmons comes into this matchup batting .281 with an OBP of .339. He has 71 hits this year along with 28 RBI in 253 AB's. He maintains a slugging percentage of .407 with an OPS+ of 103. Yunel Escobar is hitting .276 this season and he has an OBP of .333. He has collected 55 hits in 199 at bats while driving in 18 runs. He has an OPS+ of 103 and a slugging percentage of .412. The Angels as a unit have 549 base hits, including 98 doubles and 73 homers. Los Angeles has walked 234 times this year and they have struck out on 510 occasions. They have had 455 men left on base and have an OPS of .698. They have scored 4.22 runs per game and totaled 287 runs this season. Who will win tonight's Royals/Angels MLB game against the spread?